This article is about the movie starring Kirk Cameron. For the movie starring Edward Asner, see Saving Christmas (2017 film). 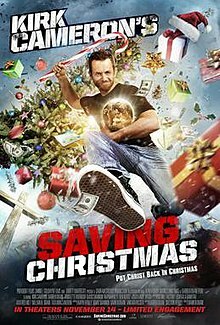 Saving Christmas (also known as Kirk Cameron's Saving Christmas) is a 2014 American faith-based Christmas comedy film directed by Darren Doane and written by Doane and Cheston Hervey. It was theatrically released by Samuel Goldwyn Films on November 14, 2014. It stars Kirk Cameron as a fictional version of himself. In Saving Christmas, Cameron, after explaining his views on Christmas directly to the audience, tries to convince his fictional brother-in-law, played by the film's director, that Christmas is still a Christian holiday. The film combines a comedic narrative with educational elements, in order to "put Christ back in Christmas"; it says that most of Christmas' popular elements are biblical in origin, while criticizing the modern-day view of the holiday, especially from atheists. During the story, the film depicts some of the biblical events mentioned by Cameron, while he provides narration for the audience. The film received a 0% rating on Rotten Tomatoes. It was nominated in six categories for the 35th Golden Raspberry Awards and "won" four, including Worst Picture. It also became the lowest rated film on the IMDb Bottom 100 List within one month of its theatrical release, and is now considered one of the worst films of all time. Cameron blamed atheists for the film's poor reception. In a framing sequence, Cameron—as himself—addresses the audience from beside a fireplace, explaining his love of Christmas. Cameron goes on to express his views on the contemporary celebration of Christmas, which include his beliefs that atheists have tried to "take the holiday away" and that Santa Claus is a Christian. Cameron also criticizes fundamentalist Christians who have politicized the holiday by tying the celebration to pagan traditions and making accusations that the holiday has become too tied to materialism. The film switches to its main narrative, in which Cameron attends a Christmas party at his sister's house. There, he notices that his brother-in-law, Christian, is not celebrating like the other guests. When asked why, Christian tells Cameron that he feels the holiday became too commercialized and consumerist, and that he feels uncomfortable with what he believes are pagan elements of contemporary Christmas celebration. Cameron tells Christian that he is wrong and recites the story of the Nativity, which is depicted in cartoon form. Meanwhile, two guests at the party discuss conspiracy theories. Christian complains that several elements of Christmas, most notably Christmas trees, are not biblical in origin. Cameron tells him that Christmas trees were God's idea, since God created trees. He also says that each tree represents a Christian cross; breaking the fourth wall, Cameron encourages the audience to visualize a cross every time they see a Christmas tree. Cameron further addresses several other concerns Christian has about the historicity of the holiday, including its date and the role of the Three Wise Men. Cameron ties the Nativity directly to the crucifixion, saying that Baby Jesus' swaddling cloth was a foreshadowing of his burial shroud, and claims that the gifts of frankincense and myrrh were used to treat dead bodies in a form of primitive embalming. Cameron encourages Christian and the audience to place nutcracker dolls around Nativity sets to represent Herod's soldiers during the Massacre of the Innocents. Christian is convinced by the arguments, but then complains that Santa has co-opted Jesus as the figurehead of the holiday; he further expresses discomfort over the fact that "Santa" is an anagram of "Satan". Cameron tells Christian the story of Saint Nicholas, including a reenactment of the First Council of Nicaea in which Nicholas violently beats Arius for heresy. Cameron claims that, after the council, Nicholas went out and began beating heretics for teaching false doctrine, and that "Nicholas was 'bad', in a good way". Cameron explains that St. Nicholas was the basis for Santa Claus, who was a byproduct of Nicholas' story being diluted by secular culture. With this knowledge, Christian joyous declares that "Santa is the man". Reassured of Christmas' Christian roots, Cameron and Christian return to the party. Cameron criticizes people who feel that the holiday is too commercial, saying that because God took on material form, it is appropriate to celebrate using material things through the giving of expensive gifts. Cameron explains that presents represent Jerusalem, and that Christmas is "doing what God does", as God has given humanity many gifts. Cameron then issues a plea to the audience to make Christmas an overtly religious holiday again, "for our children". Christian, as a gift to his wife, organizes a hip hop dance to symbolize his love of Christmas, set to "Angels We Have Heard on High". Cameron, Christian, and all the party guests breakdance in an extended musical sequence. Cameron then tells everyone to feast, and suggests the audience organize the best dinner possible for Christmas, but not to forget it is a celebration of God. Saving Christmas debuted on 410 screens on November 14, 2014. On its first weekend, the film came in fifteenth place with ticket sales of $992,087, with a per screen average of $2,420. In its six-week run, the film grossed $2,783,970 at the box office. Based on a $500,000 budget, the film can be considered a box office success. On Rotten Tomatoes, the film received a rating of 0%, based on 14 reviews, with an average rating of 1.6/10. On Metacritic, the film received a rating of 18 out of 100, based on 9 critics, indicating "overwhelming dislike". New York Times film critic Ben Kenigsberg said that Cameron's acting "sounds so forced you half-expect the camera to pull back to reveal hostage takers". Billings Gazette named it the worst Christmas movie of all time in 2016, and Will Nicol of Digital Trends included it on his list of the ten worst movies ever made. Christy Lemire picked Saving Christmas as the worst film she has ever reviewed. In The Christian Post, an Evangelical Christian newspaper, Emma Koonse wrote, "[Kirk Cameron] dismisses theories that Christmas is derived in [sic] the pagan celebration of Winter Solstice in Saving Christmas, offering viewers a Biblical reference to items such as the Christmas tree instead. Furthermore, the film reveals Cameron's take on Santa Claus, the three wise men, and why Christmas is celebrated on Dec. 25 each year... Although Cameron attempts to defend Christmas traditions in Saving Christmas, many Christians remain divided over what the Bible says about celebrating Christ's birth as well as where the varied Christmas traditions originated and what the customs mean in reference to Jesus." On November 20, Cameron responded to the negative reviews by posting on his Facebook page. He wrote, "Help me storm the gates of Rotten Tomatoes. All of you who love Saving Christmas – go rate it at Rotten Tomatoes right now and send the message to all the critics that WE decide what movies we want our families to see." The attempt resulted in a severe backlash in which Internet users traveled to the Rotten Tomatoes page and condemned the film. Three weeks after the film's release, the film gained additional notoriety when it became the lowest rated film on IMDb's bottom 100 list. Cameron later responded to the low rating, saying that it was due to a campaign on Reddit by "haters and atheists" to purposely lower the film's ratings. Saving Christmas was released on DVD on November 3, 2015. The film was also made available on Hulu in March 2016. A soundtrack album was released on October 27, 2014 by Reunion Records. ^ Siegemund-Broka, Austin (August 27, 2014). "Kirk Cameron's Faith-Based 'Saving Christmas' Picked Up for Limited Release". The Hollywood Reporter. Retrieved March 19, 2016. ^ XDX2 at the Internet Movie Database. Retrieved November 25, 2015. ^ a b "Kirk Cameron's 'Saving Christmas' Is The Best … Of The Worst IMDb Films Ever". Business 2 Community. December 5, 2014. Retrieved October 19, 2015. ^ a b "Kirk Cameron's Saving Christmas". Box Office Mojo. Retrieved December 16, 2014. ^ Siegemund-Broka, Austin (August 27, 2014). "Kirk Cameron's Faith-Based Saving Christmas Picked Up for Limited Release". The Hollywood Reporter. Retrieved October 19, 2014. ^ Gilman, Greg (August 28, 2014). "Kirk Cameron Is Saving Christmas in New Trailer". TheWrap. Retrieved October 19, 2014. ^ Hallowell, Billy (August 27, 2014). "Hollywood Actor Says His New Movie Will Hammer Political Correctness and Frustrate Atheist Activists". TheBlaze. Retrieved October 19, 2014. ^ O'Neal, Sean (August 28, 2014). "Kirk Cameron to Make Christmas Safe for Christians". The A.V. Club. Retrieved October 19, 2014. ^ a b Holley, Peter (December 8, 2014). "Kirk Cameron Says Kirk Cameron's Saving Christmas Is the Target of an Atheist Conspiracy". The Washington Post. Retrieved December 9, 2014. ^ "Kirk Cameron's Saving Christmas". Rotten Tomatoes. Retrieved January 2, 2016. ^ "Kirk Cameron's Saving Christmas". Metacritic. Retrieved November 22, 2014. ^ Kenigsberg, Ben (November 13, 2014). "To Save Us All From Satan's Power", The New York Times. Retrieved December 28, 2014. ^ "The 25 Worst Christmas Movies of All Time". Billings Gazette. December 12, 2016. Retrieved December 31, 2016. ^ Nicol, Will (May 10, 2017). "10 Worst Movies You Can Watch". Digital Trends. Retrieved July 21, 2017. ^ Kohn, Eric (June 19, 2017). "Critics Pick the Worst Movies They've Ever Reviewed". Indiewire. Retrieved July 19, 2017. ^ Koonse, Emma (November 12, 2014). "Kirk Cameron Hopes Audiences 'Throw Both Arms Around Their Christmas Tree' After Watching Saving Christmas; Challenges Pagan Ownership of Holiday", The Christian Post. Retrieved November 12, 2014. ^ Gettys,Travis (November 21, 2014). "Kirk Cameron Is Begging Fans to Help Boost His Movie's Putrid Rating on Rotten Tomatoes". The Raw Story. Retrieved November 21, 2014. ^ Koonse, Emma (November 21, 2014). "Kirk Cameron Urges Fans to Improve Saving Christmas Rating, 'Help Me Storm the Gates of Rotten Tomatoes'". The Christian Post. Retrieved November 21, 2014. ^ "Kirk Cameron Tried To Cheat Rotten Tomatoes, It Did Not Go Well". CinemaBlend. November 25, 2014. Retrieved December 1, 2014. ^ Kaufman, Scott (December 5, 2014). "The People Have Spoken! Kirk Cameron's Saving Christmas Is IMDB's Worst Film of All Time". The Raw Story. Retrieved December 5, 2014. ^ Mauney, Matt (December 5, 2014). "Kirk Cameron's Saving Christmas Officially Worst Movie in IMDb History". Orlando Sentinel. Retrieved December 5, 2014. ^ O'Neal, Sean (December 5, 2014). "Kirk Cameron Is Crucified at the Hands of IMDb Users, Rises with Jesus Coffee". The A.V. Club. Retrieved December 9, 2014. ^ "RAZZIES® Celebrate 35 Years of Worst Achievements in Film with Inclusive Nominee List ...and New "Redeemer" Award". Golden Raspberry Award Foundation. Retrieved January 14, 2015. ^ King, Susan (February 21, 2015). "Kirk Cameron's Saving Christmas Dominates the 35th Razzie Awards", Los Angeles Times. Retrieved February 22, 2015. ^ "Saving Christmas DVD Release Date November 3, 2015". DVDReleaseDates. Retrieved October 19, 2015. ^ Bradley, Lauren; Wickman, Forrest (March 1, 2016). "The Best Movies and TV Shows Coming This Month to Netflix, Hulu, HBO Now, and Amazon Prime". Slate. Retrieved March 19, 2016. ^ "Kirk Cameron's Saving Christmas Soundtrack Details", Film Music Reporter. Retrieved February 13, 2015.